Sigma Beauty is a leading manufacturer of professional quality brushes for makeup artists and beauty enthusiasts alike. Always striving forwards with the latest innovations in brush technology, Sigma is internationally known for delivering innovative products that offer versatile usage. 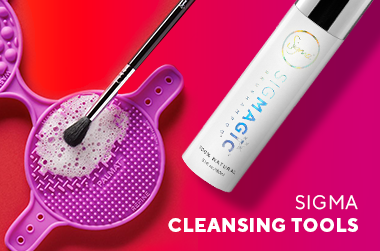 Sigma Beauty was founded in 2009 by native Brazilians Rene Xavier Filho and Simone Oliveira Xavier. Their online beauty store was committed to providing beauty junkies with the most innovative cosmetics, brushes, and brush-care accessories on the market. With respective backgrounds in civil engineering and molecular biology, this dynamic team wanted to make quality cosmetics tools featuring innovative designs and new functional concepts. This creative vision resulted in Sigma Beauty&apos;s securing several U.S. patents for its innovative designs. This commitment to purpose quickly transformed Sigma Beauty into a well-respected retailer with a reputation for selling quality products. In 2012, Sigma Beauty opened its first brick-and-mortar store in the biggest mall in the United States: the Mall of America in Minnesota. Since that time, Sigma Beauty has quickly grown into a respected global company with authorized retailers in over 225 countries. From kabuki brushes to brow and lip brushes, Sigma Beauty offers a brush for every cosmetic formula and application process. The patented design elements along with the brand&apos;s reputation for superior quality ensure that you will be pleased with all brushes from Sigma. If you are new to makeup tools and do not know where to start, try the Sigma Essential Kit. This comprehensive kit contains everything you need to introduce yourself to Sigma Beauty, from foundation, concealer, and blushes to blending and finishing brushes. Are SigmaTech® fibers better than natural bristles?